Those are all well and good, but being the keen observer that you are, you will have noticed that something is missing. 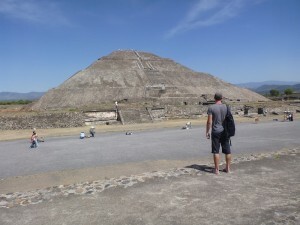 Teotihuacan was just the warmup. This is a long stage. I’ll be going from mountains to beaches to mountains to steaming jaguar infested jungles and then back to beaches over the next two months but rest assured that Tony and I are ready. Tony has been outfitted with new waterproof rear panniers, ready for those warm tropical showers that the island boy in me loves so much. 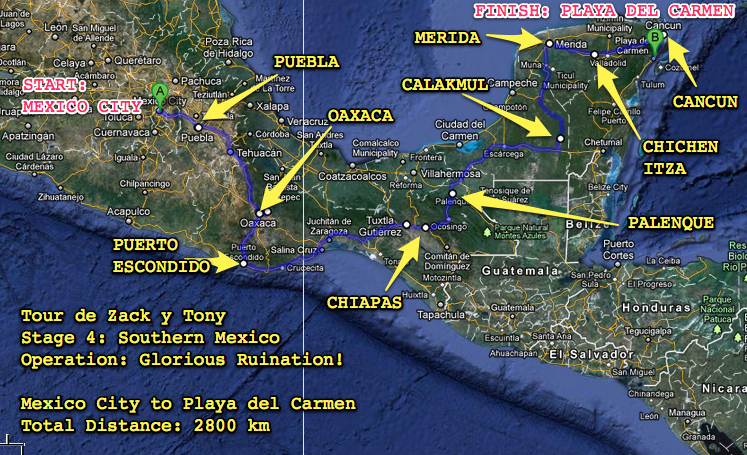 Unfortunately the super-tires that I ordered got “lost” in the post somewhere in Mexico, so we will be continuing with the cheap mexican tires we are currently sporting until Oaxaca -there we will be swapping out for some tires more suited to off-roading. My two relaxed weeks in Mexico City has done me wonders, I am feeling rested and revitalised and more than ready to rock this next stage. Special mention of thanks goes out to my friends Polo, Raquel, and Fabiola who have had to put up with me in their living room for this entire time. You are all stars.